All over Indonesia today, citizens marked Independence Day – Hari Merdeka. But preparations and celebrations started long ago. Since the beginning of August, groups of students could be heard (and seen) belting out chants and patriotic tunes, all around town. Dressed in matching uniforms and baseball cap s, sometimes carrying poles and instruments, they would emerge from a school and march in formation along Ubud’s roads. You could hear them approaching from a kilometer away, so powerful were their voices. But sometimes, as I learned long ago, one has to step beyond the veil, past what one sees on the street – to appreciate the full gamut, the quirks, the uniforms – all that unfolds behind the scenes. So, with an invitation from a couple of friends, yesterday I strolled down to their children’s elementary school; a place of some renown (and not only because it was founded by Agung Rai of ARMA Museum). Preps were high gear; the courtyard festooned with red-and-white flags and banners, and similar ribbo ns wrapped around the heads of most of students as if candy canes. Teachers, wearing red sweatpants, white tops and baseball caps (often comprising a de rigueur element to compliment one’s uniform! ), gathered together, directing students into formation. Instruments were in hand or stored in a nearby classroom. The costumes and make-up were formidable; the kids in the marching band – each one holding a pianica (aka melodica) – looked like miniature actors culled out of the timeless film, The Music Man; each one decked out in identical pastel blue-and-pink costumes. The others, depending on their roles, wore tra ditional Balinese dress or striped outfits. Some of the girls’ long plaited hair was knotted in up-dos, petals tucked into buns. Of course, they stood at attention and sang the national anthem. 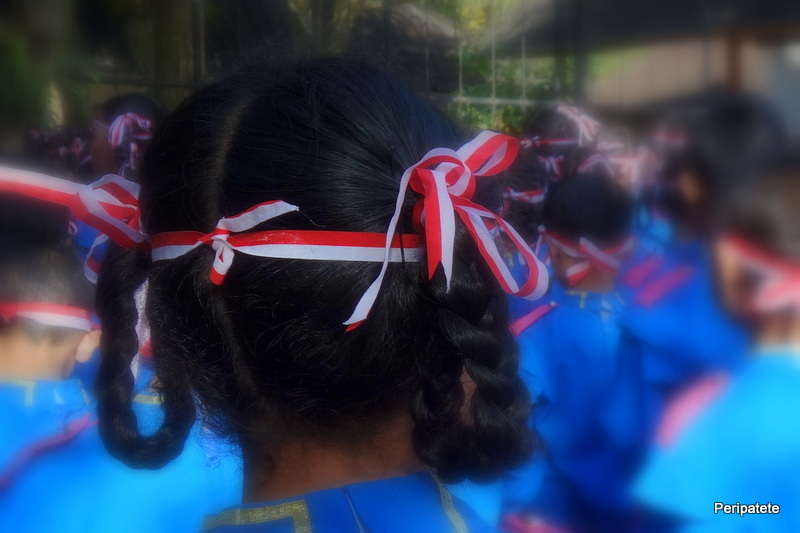 But before the rambunctious group of kids could head out on parade, standard Balinese protocol had to be followed: The entire student body, staff and parents, stood, laid down their instruments and face d east – towards the holy peak of Mount Agung. With palms touching, eyes closed and an ambience temporarily turned solemn, prayers and chants were intoned by all; deities were acknowledged, gods thanked, nature blessed. Then, after a moment of silence, a pregnant pause held everyone in its grip… until a spirit of heightened joy and camaraderie returned and prevailed. Never mind the traffic snarls, the farmers cycling by to weed their fields, the men heading to the temporary gambling and cockfighting ‘den’ next door, the dogs and roosters crossing the street. The students got into line and off they went, tooting horns, banging on drums, twirling, tapping, shouting all the way into town. It would have been beautiful to witness how Independence Day was marked on other islands – Java, Lombok, Flores, Sumatra, Sulawesi, Sumba and many others; but, my guess is that none of the celebrations elsewhere in the Indonesian archipelago came close, without such pin-stripes-and-cotton-candy charm and color, to the exuberance of Bali’s festivities.